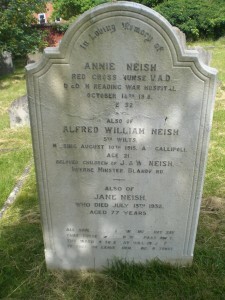 Annie Neishe was the daughter of William and Jane Neishe, of “Elem”, Pilford Heath, Wimbourne, Dorset. The 1911 census indicates that Annie, then 24, was domestic nurse. Her father was a gardener and her brother, then 17, was working in the gardens. The home address is given as The Gardens, Iwerne Minster, Blandford. In 1901 William Neishe was recorded as the Head Gardener at Caldy Manor in Cheshire. The family had moved around the country. The second daughter Minnie is recorded in the 1901 census. A further child had died. Upon Jane’s death in 1932 Minnie was the sole beneficary of her estate. Annie’s is a registered war grave with a private memorial. She is buried with her mother. The headstone bears a commemoration to her brother and father. Grave number 16489. 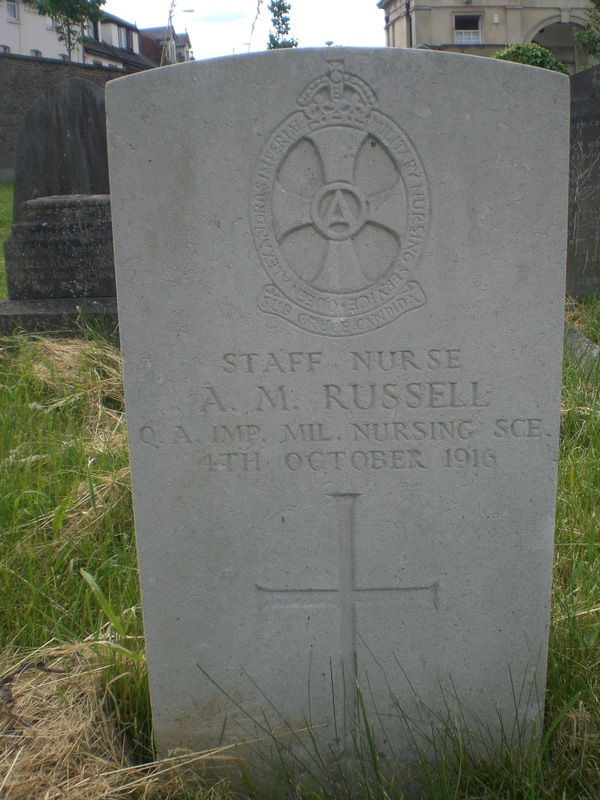 Annie died on 18th October 1918, aged 32. The circumstances of her death are unknown. There was a serious influenza epidemic at the time. VAD nurses also worked very hard and for long hours, in a compromised state of health they frequently succumbed to illness. Alfred William Neishe was the son of William and Jane Neishe and the brother of Annie. He is commemorated on the headstone of Annie and her mothers grave. He was killed in action at Gallipoli on 10th August 1915. There had been very vicious fighting since the allied landing on 6th August, in conditions of intense heat. On the 10 August a Turkish counter attack on Chunuk Bair almost succeeded. Alfred Neish may well have been involved in these actions. The 5th Wiltshires incured heavy losses on 10 August. Alfred has no known grave and is commemorated on the Helles Memorial to the Missing, Panel 156-158. Reading.